A new, fully automated affinity purification solution is designed to enable scientists to analyze large biomolecules, such as proteins and antibodies, with improved accuracy, consistency and simplicity, even at high throughputs. 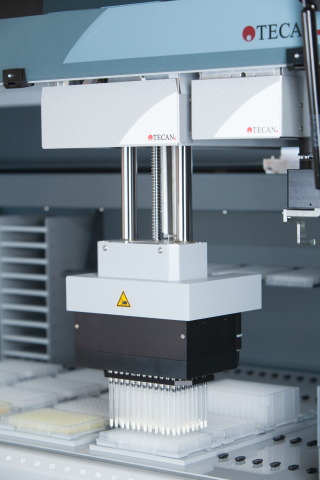 The new Thermo Scientific MSIA Strepdavidin EVO microcolumns have been designed to bring the novel mass spectrometric immunoassay (MSIA) affinity purification technology to Tecan’s Freedom EVO series of robotic platforms that are equipped with a 96 multichannel arm (MCA96). Biopharmaceutical, translational, clinical and sports anti-doping labs performing high-throughput characterization of large molecules are commonly challenged by the limitations of conventional affinity purification methods. These challenges include low efficiency, inconsistent results, high background and carryover and the inability to standardize methods and transfer between labs. As a result, researchers often invest time in generating data that may not reflect the accuracy needed. When combined with the Tecan Freedom EVO robotic platform, MSIA Streptavidin EVO microcolumns enable fast and accurate isolation of target analytes from complex biological matrices. Housed within a pipette tip, the proprietary monolithic columns are densely coated with streptavidin for analytical affinity purification of any biotinylated affinity ligand, even at low concentration. Since this technology is incorporated into a pipette tip, users can analyze sample volumes as low as 10 µL, saving precious samples. Furthermore, when compared to traditional resin and bead-based methods, MSIA technology provides lower background noise and improved analytical sensitivity, while the simple workflow enables easier method standardization and transfer between labs. Until now, the MSIA technology has been exclusively available for use with the Thermo Scientific Versette Automated Liquid Handler and Thermo Scientific Finnpipette Novus i Multichannel Electronic Pipette for high- and low-throughput applications, respectively. The MSIA Streptavidin EVO microcolumns have been designed to enable a broader community of high-throughput bioanalytical researchers to benefit from automated liquid handling for large molecule bioanalytical assay development. For more information on the MSIA technology and how MSIA workflow solutions enable highly reproducible and sensitive testing of large molecule analysis, please visit: https://www.thermoscientific.com/content/tfs/en/products/mass-spectrometric-immunoassay.html?wt.mc_id=lhc_msia_banner_prfirm_0116a. For more information on Tecan’s robotic liquid handling solutions, please visit www.tecan.com/analyticalchemistry.